The Lazio Counter Top Basin with a Wall Mounted Basin Mixer features a stylish square base with sloping edges and a modern wall mounted chrome plated brass basin mixer tap. 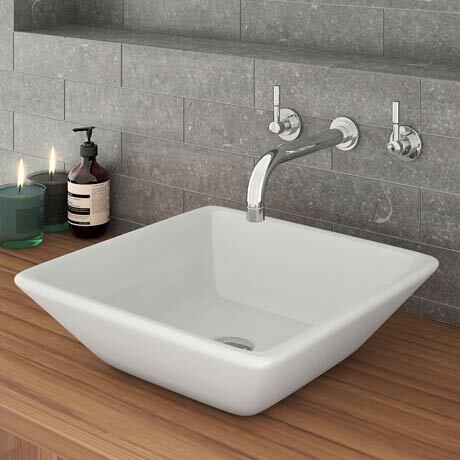 Washbasin has been designed to be mounted onto a worktop console or piece of vanity furniture, create a modern clean feel in your bathroom with this minimalist styled basin and tap package. Comes with a 5 year guarantee. Some small dimensional variation may occur due to manufacturing tolerances.